Beautiful You: Travel Tips, Part 2 | What Skincare I Took Away With Me! Travel Tips, Part 2 | What Skincare I Took Away With Me! Today's post is the second instalment from my travel tips series and this week it is all about the skincare that I have taken with me to New York. I am not usually one for taking it with me when I go away but I know that being in a big city all day and being out in the cold can take its toll on you skin so I thought that I would take a few products to keep on top of my skincare. 1. Garnier Micellar Water- everyone knows that after a long day there is nothing better than taking all your make-up off. I find that the best way to do this is with micellar water and this one in particular is amazing. I am usually a Bioderma girl but I haven't been able to get my hands on it for a while so this one is slowly becoming my new favourite and it does have a friendlier price tag as well which is a bonus. 2. Neutrogena 2 in 1 Face Wash/Mask- this is perfect for double cleansing as it is a refreshing wash that isn't too hard on your skin so therefore can be used on a daily basis. I always find that there is always some make-up left on your face after you have used your make-up remover and this is the best wash I have found to clarify my skin! 3. Botanics Rose Water- this product is brilliant for toning the skin after I have washed my face, it adds hydration whilst making my skin feel really smooth and tight. I have decanted this into a smaller pump bottle as I didn't need to take the entire bottle with me and it saves on space and weight in my case. 3. Simple Light Moisturiser- this gives you 12 hour moisturisation and it is perfect because it comes in a smallish bottle that can easily be packed. I am a sucker for forgetting to put moisturiser on but I am going to make the effort during the time that I am there because I know my skin will need in when being faced with the harsh weather! I hope you have enjoyed this post and as you know I am currently in New York but I hope you are enjoying this series none the less. Let me know in the comments what you favourite products are to travel with and if you have any tips that you think I should know! Hope you have all had a lovely weekend and I shall be back on Wednesday for the last instalment of the series! 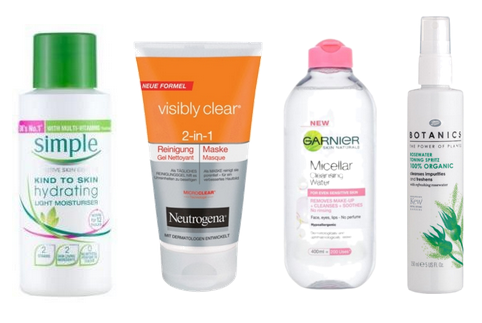 I love micellar waters, especially the nivea sensitive one!